Birth records for Mississippi were unavailable at the time of data extraction and contributions from your family file will be gratefully accepted. There are 750 surname entries and given names have an unusually high number of variations in spelling. Keywording will not be effective but browsing the entire file will provide better results. This file was extracted in its entirety by K. T. Mapstone. It is the onus of the user to verify the data. Terry Dalton, Tishomingo County, Rienzi P.O. John Dalton, Carsons Landing P.O. J.M. Dalton, Pine Bluff P.O. Thomas Dalton, Pine Bluff P.O. William B. Dalton, Cumberland P.O. Dennis Dalton, Holly Springs P.O. George Dalton , Oak Grove P.O. Sallie Dalton , Aberdeen P.O. This is an Index by County. For additional details refer to the Census enumerations. 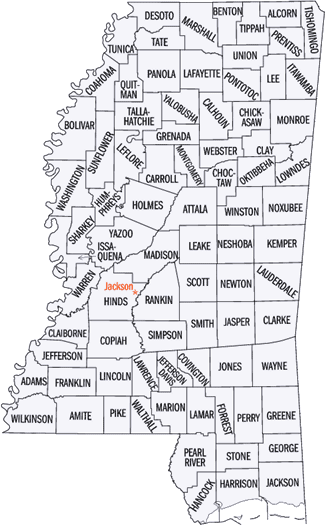 Section I Daltons whose SS# was issued in Mississippi and whose last residence was in Mississippi. Organized by County of Last residence. Organzied by state of residence. Organized by state of issue.